Winter is the season for planting Bareroots and our biggest euro-saver tip this winter season is to get planting bareroots. 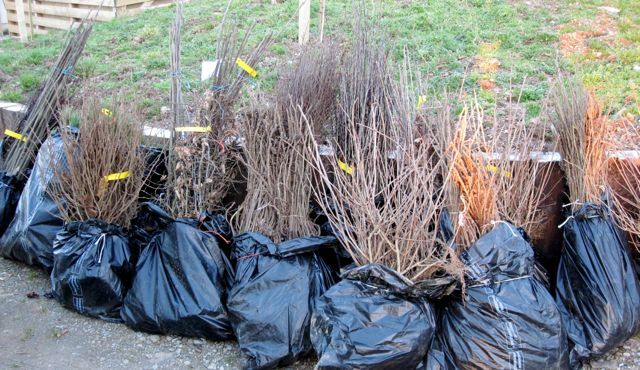 The main advantage to buying trees and hedging plants ‘bareroot’ is their low price. For example the cost of a bareroot tree can be less than a third of the price of a container grown plant and even less for hedging stock. Bareroot stock must be potted by the start of the growing, so be quick! The plants are lifted during the dormant season (cold winter months), maintaining as much of the root system as possible, with the soil removed and the roots carefully protected these plants can be kept out of the ground and easily transported. Apart from the significant savings you can make, bareroots are much easier to plant and establish quickly if there is good root/soil contact. The lack of soil reduces the weight for shipping and makes planting much easier. The low cost also means you can choose to plant more densely. Trees and hedging all the way up to 2.1m can be supplied bareroot, however for hedging this would be by special request only and would need to be pre-ordered. Bareroot plants must be protected from drying out. Keep them in a cool place away from frost. If you’re unable to plant them within a few days of purchase, they should be ‘heeled’ into some soil and protected from frost, ready for use at a later date. - Dig a hole or trench wide enough to accommodate all of the roots. Planting depth should be to the nursery soil mark on the stem. - Make sure the depth allows the roots to be as straight as possible, avoid bunching up and allow extra space for root expansion. - Include a compost high in nitrogen when you backfill. Manure based composts are ideal for transplanting bareroot plants. - Do not plant in waterlogged or frost covered/frozen soil. If you need to plant during the frosty winter months, cover the area you’ll be planting with mulch/ straw a few days in advance to keep the frost out. - Remember to stake and tie (rubber ties) the tree after it is planted. - The roots should be moist before planting. - Open up a slit in the soil, push a spade few inches deep and move back and forward. - Slide the root of your bareroot plant into the slit, up to the nursery soil mark. - ‘Heel in’ tight to ensure good soil/root contact. - This is a very successful method for establishing large quantities of small hedging. - Water in well, even if rain is on the way. - Add a layer of mulch, such as wood chips. This will cut out weed competition and trap moisture. - Stake trees and hedging plants with bamboo canes, or wooden posts and rubber ties for larger specimens. The stake should be no more than the height of the tree or hedge you are planting. It should be placed on the side that will receive the most wind. - Protect the stem with a spiral rabbit guard, or a suitable tree, shrub or deer guard. Continue to water regularly for the first year after planting. It’s easy to remember in hot summer, but cold winter and spring months can also be quite dry. Installing an irrigation system will make watering easier and more reliable. By following these few simple rules you will find you have successful establishment. Bear in mind that an overall failure rate of 5% is considered acceptable when planting bareroot. Your planting density should take this into account. Continual vigorous growth will be ensured by annually topping up your mulch in the spring. As much as one third extra growth per annum can be obtained by continuing this regime in the early years post planting.